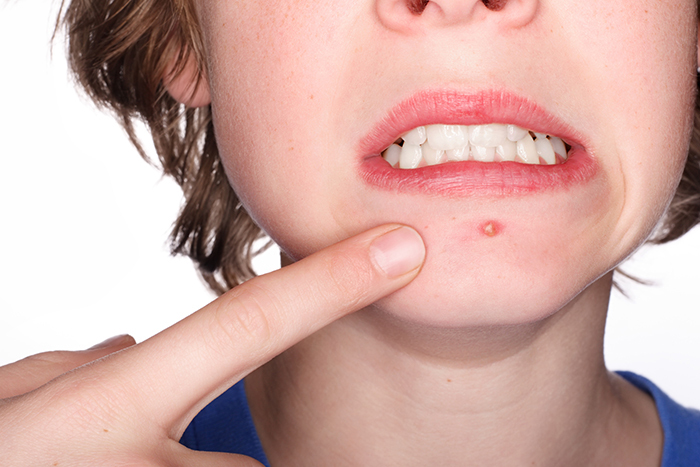 Take a natural approach to soothe acne without dangerous chemicals. In 2016, the FDA approved an over-the-counter retinoid drug for acne -- the first new active ingredient available without a prescription since the 1980s. Treatment with isotretenoin (a synthetic derivative of vitamin A) is reserved for patients with the most severe acne because of its extreme toxicity, including severe birth defects, and its association with inflammatory bowel disease, depression, and suicidality. 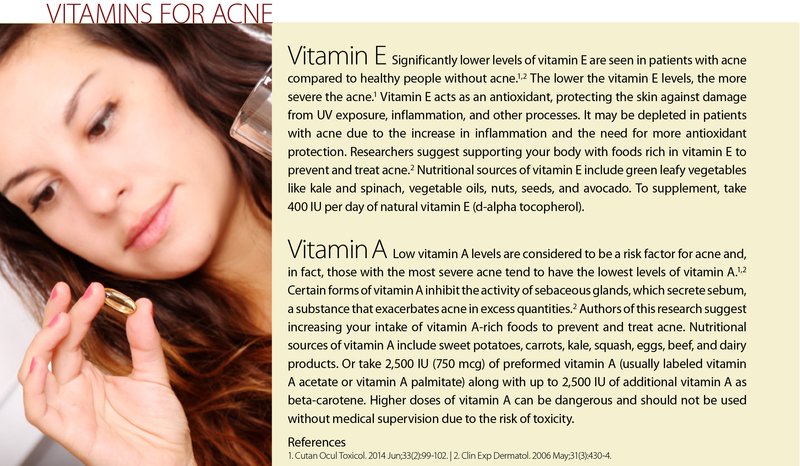 Numerous natural topical treatments, oral supplements, and dietary therapies have been found to effectively treat acne. Those with the greatest evidence for effectiveness are oral zinc supplementation, topical treatment with nicotinamide or tea tree oil, and a low glycemic load/dairy-free diet. Take 30 mg of zinc two or three times a day for a few months, then reduce the dose to 30 mg per day thereafter. Long-term zinc supplementation requires 1 to 2 mg of copper per day to prevent copper deficiency. Apply a product containing 5% tea tree oil, such as Tea Tree Medicated Gel for Acne, by Thursday Plantation, twice a day. Leave on for up to 20 minutes and then rinse off with water. Never apply pure (100%) essential oils of any kind directly to your skin. The more dairy you eat and the higher the glycemic load of your diet, studies show, the more likely you are to have acne and the more severe it is likely to be.24-26 Dairy products and high glycemic foods (such as sugar, white flour, white potatoes, and white rice) are believed to cause acne by increasing insulin and insulin-like-growth-factor-1 (IGF-1). The most effective acne treatment involves a comprehensive and holistic approach that addresses the underlying inflammatory triggers, including diet and nutrition, sleep, stress, and other lifestyle factors. But incorporating one of more of the recommendations above will significantly improve acne vulgaris for most people. 1. J Am Acad Dermatol. 2008 Jan;58(1):56-9. 2. Pediatr Dermatol. 2011 Nov-Dec;28(6):645-8. 3. J Clin Aesthet Dermatol. 2014 Feb;7(2):22-30. 4. Exp Dermatol. May 2013; 22(5): 311–315. 5. J Drugs Dermatol. 2014 Apr;13(4):428-35. 6. Cutan Ocul Toxicol. 2014 Jun;33(2):99-102. 7. Biomed Res Int. 2014;2014:474108. 8. J Clin Invest. Nov 1, 2007; 117(11): 3166–3169. 9. Benef Microbes. 2014 Jun 1;5(2):185-99. 10. J Clin Invest. 2014 Oct 1;124(10):4212-8. 11. J Pediatr Adolesc Gynecol. 2013 Oct;26(5):290-3. 12. Dermatol Res Pract. 2014; 2014: 709152. 13. Br J Dermatol. 1977 Dec;97(6):681-4. 14. Acta Derm Venereol. 1980;60(4):337-40. 15. J Drugs Dermatol. 2013 May;12(5):542-5. 16. Dermatol Ther. 2010 Jul-Aug;23(4):411-8. 17. Int J Dermatol. 2013 Jul;52(7):784-90. 18. Med J Aust. 1990 Oct 15;153(8):455-8. 19. Indian J Dermatol Venereol Leprol. 2007 Jan-Feb;73(1):22-5. 20. Australas J Dermatol. 2014 Aug;55(3):169-75. 21. Int J Dermatol. 1995 Jun;34(6):434-7. 22. Int J Dermatol. 2013 Aug;52(8):999-1004. 23. Int J Cosmet Sci. 2011 Oct;33(5):467-76. 24. Acta Derm Venereol. 2012 May;92(3):228-31. 25. BMC Dermatol. 2012; 12: 13. 26. J Acad Nutr Diet. 2014 Mar;114(3):384-92. 27. Exp Dermatol. 2013 May;22(5):311-5. 28. Hautarzt. 2013 Apr;64(4):252, 254-8, 260-2. 29. Rocz Panstw Zakl Hig. 2012;63(1):9-15.
acne, alcohol, anti inflammatory, antibiotics, antimicrobial, antioxidant, antioxidant activity, bowel disease, children, dairy, dairy free diet, depression, diet, digestive, dysbiosis, excessive alcohol intake, glycemic load, high glycemic, high glycemic foods, high glycemic load, holistic, inflammation, inflammatory bowel, inflammatory bowel disease, insulin, leaky gut, leaky gut syndrome, milk, niacinamide, nutrition, paleo diet, pcos, potatoes, refined grains, side effects, skin, sleep, smoking, stress, stress hormones, studies show, sugar, supplement, supplements, tea tree oil, vegetables, vitamin, vitamin a, vitamin b3, zinc, zinc supplement, zinc supplements.